Apple has successfully finalized a solution to integrate Touch ID fingerprint recognition directly into the display of its upcoming "iPhone 8", according to a new report on Friday. Chinese-language Economic Daily News (EDN) said it spoke to sources from Apple supplier Taiwan Semiconductor Manufacturing Company (TSMC), who apparently confirmed Apple's achievement during a technology convention held in Taipei on Thursday. Among several design changes TSMC reportedly discussed at the TSMC 2017 NA Technology Symposium was the lack of a home button on the redesigned OLED iPhone, owing to Apple's use of "an optical fingerprint sensor to enable authentication directly on the screen" in the absence of a physical Home button. In addition to the fingerprint recognition, the sources claimed the new iPhones will also come with "invisible infrared image sensors to enhance the functionality of the high-pixel camera" and to enable augmented reality functions. If true, news of Apple's on-screen fingerprint recognition solution will come as a relief to watchers tracking the development of Apple's "tenth anniversary" edition iPhone. Reports that the company has been researching ways to integrate fingerprint sensors directly into screens go as far back as June 2015, but more recent sources have claimed Apple has struggled to find a solution that overcomes the production challenges involved. Specifically, Apple was said to be facing low yield issues of its in-house fingerprint sensor solution, which may have been forcing it to consider three possible alternatives: remove Touch ID from the 5.8-inch iPhone entirely and rely on other forms of biometric authentication instead, place the sensor on the back of the device (similar to the one on the Samsung Galaxy S8), or delay production of the phone. The security of existing face and iris recognition technology has already come into question, while the idea of a rear-mounted Touch ID fingerprint sensor has received a largely negative response from current iPhone users. Suggestions that Apple could announce the OLED iPhone in September alongside typical "S" cycle iPhones but delay its availability have also been met with skepticism. Additionally, today's news also lines up with previous rumors claiming Apple has been aiming to finalize its fingerprint sensor specification in May all along, in time for mass production in late July, which would fall in line with the company's usual annual iPhone production timeframe. 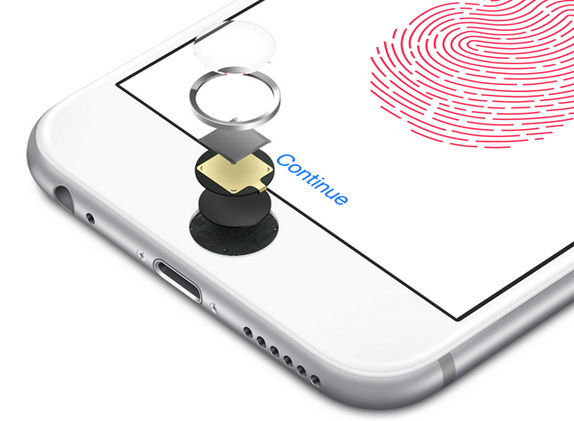 The other design changes mentioned by sources at TSMC suggest additional biometric authentication such as iris/facial recognition could be used to augment Touch ID via a high pixel-density front-facing camera, which is expected to feature next-generation 3D-sensing capabilities powered by PrimeSense technology. The report also claims the screen ratio of the displays on the new iPhones will be adjusted to 18.5:9 instead of the previous 16:9. The "iPhone 8" is thought to have a redesigned steel and glass chassis, an edge-to-edge OLED display, and could carry a "premium" price, compared to previous models. Apple is expected to debut the new iPhone in the fall alongside updated versions of its current 4.7-inch and 5.5-inch device lineup. Fantastic, I'm ready to pre-order now Apple! Now, this is much better! I don't think any of us want Touch ID on the back of the phone. May 2017: rumours of TouchID into the display. Loyal Apple fan: "Good, cause I never will get an iPhone with the TouchID on the back!" This same loyal Apple fan as in earlier May 2017: "when do the pre orders start Tim, got my creditcard ready! come on Apple!" Sounds like an Apple Galaxy iPhone S8. The S8 does not have a revolutionary screen-embedded fingerprint sensor, so no, the iPhone 8 just does not sound like that piece of overpriced, ridicolously anti-ergonomic, form-over-function, fragile junk. I'm not sure why Touch ID on the back is such a negative for people. If it leads to a edge to edge screen I don't see people rejecting such a placement. That's design over function. We need to click the Home Button to unlock our phones, so the best place to put TouchID is in the Home button itself. On the other hand, having it on the back makes it impossible to unlock a phone resting on a table. That's fine with me. Shaping up to be a great phone. iPhone with a galaxy s8 type display? Yes please. Sorry folks, but, no, it's no a "Galaxy S8 display", first, because the Xiaomi Mi Mix did that in 2016, second, because Samsung put the fingerprint sensor on the back, trading convencience for looks. There's not a single adavantage to have the sensor on the back. Hope you like fingerprints on your cameras, and not being able to unlock the phone when on a table. It's awkward to use. On the front you can hold the phone with one hand and use any finger from the other. Or you can one hand it and use your thumb. Or if it's sitting on a table you can use any finger from either hand. (Obviously, yes, you have to teach the finger to the phone, but most people teach multiple fingers from both hands. I know I do). With the sensor on the back you can't activate with your fingers if it's sitting on a table -- eyes, yes, but not finger. That is a security compromise to ApplePay and any app that uses TouchID for verification. You can't naturally hold it with one hand and activate with another. It would be like Hands Yoga. And holding with one hand is also awkward because of the way you have to hold your hand to reach the sensor. It increases the likelihood of dropping it because of the looser grip. Then there are all the issues with cases, esp. ruggedized ones that makes getting to the sensor even more challenging.